Rural roads play a vital role in promoting balanced regional development by linking remote settlements and integrating them with growth and market centers. Rural roads also provide better opportunities to the population by way of improving agricultural operation and providing easier accessibility to market centers to sell agricultural products at better prices. The utilization of other socio-economic infrastructure facilities is very much influenced by the availability of a well-integrated rural road network. In this way rural roads play a vital role in shaping the rural life and promoting integrated development. 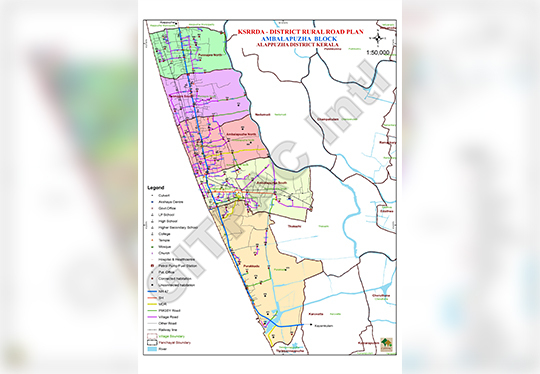 With this view of the socio-economic benefits accruing from providing road connectivity to the villages, there is a need to impart greater thrust to provide road connectivity. The Government of India launched the Pradhan Mantri Gram Sadak Yojana (PMGSY) on 25th December, 2000, with the objective of providing road connectivity through good all-weather roads to all unconnected habitations having a population of more than 1000 persons by the year 2003 and those with a population of more than 500 persons by the end of the Tenth Plan Period (2007). Our objective was to develop and make operational, a computerized, special, data base for rural roads in a GIS environment for effective management of PMGSY in the State of Kerala. 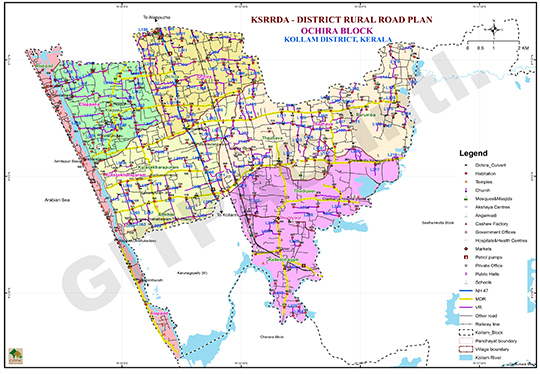 The main source of the spatial data base would be the Survey of India at 1:50,000 or larger scale and block maps already prepared by PIUs showing the DRRP/ Core network rural road. Market centers, Tourist places, Railway lines, etc.